We sell commercial and residential hardware, high security door hardward (Medeco, Schlage Primus dealers), electronic security door hardware, as well as desk and file cabinet locks/keys. 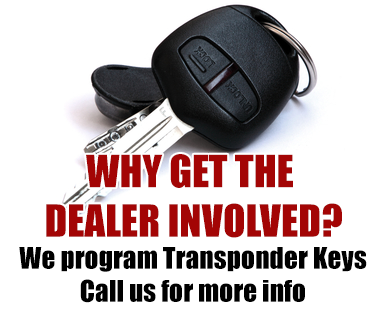 We also specialize in rare and hard to find keys.We duplicate high security automotive transponder keys for General Motors vehicles (Chevy, GMC, Cadillac, etc...), Dodge, Chrysler, Ford, Nissan, Toyota, Honda, and some Lexus. We also offer dealer original automotive Keyless Entry remotes. If we don't have what you need we'll do our best to get it for you.Can't come to us? We'll come to you. We offer full mobile service. 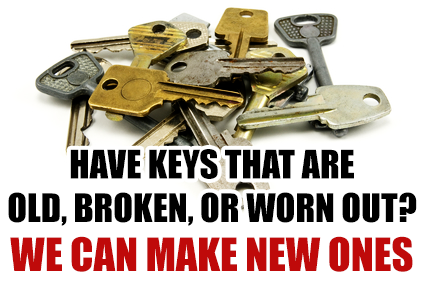 Whether you need new locks, re-keyed locks, or a whole new set of keys, we are your one stop shop. Our licensed locksmiths can help you make the decisions that fit your situation best, depending on what you need. We offer traditional lock and key sets, as well as more sophisticated keyless entry locks and bolts. You want peace of mind when it comes to your home, and we have the tools to give it to you. Sometimes you need an office door re-keyed, sometimes you need an entire suite completely redone. No matter what your situation might be, we have the skills and experience to get your job done. We can service door alarms, high security locks, file cabinets, and much more. You'll find that our service with a smile and knowledgeable licensed locksmiths are unmatched in the Los Angeles area. Buy new ignition keys, keyless auto remote, transponder, smart key, and foreign & domestic classic car, and OEM car keys and keyless entry. We offer mobile and walk-in automotive locksmith service. If you lock yourself out of your vehicle, we can get you back in, and if you need new keys for any reason, we've got you covered. Viva Zapata Lock & Key Service is family owned and operated. We have been providing security products and locksmith service (with a smile!) in Los Angeles since 1974. © 2014-2015 Viva Zapata Lock & Key. All rights reserved.